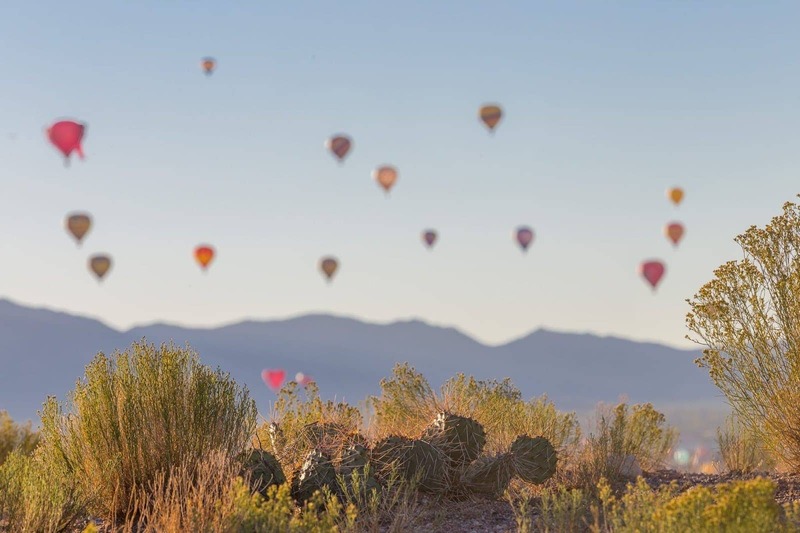 This year we took a trip to New Mexico, where we spend five weeks exploring this truly wonderful state. Lots of posts on this topic coming soon! 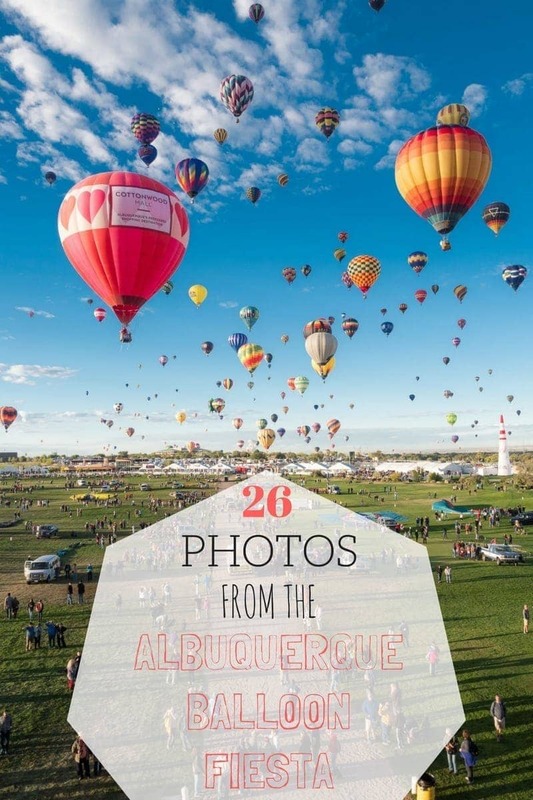 In the meantime though, I wanted to share our experiences visiting probably the most famous annual event to take place in New Mexico – the Albuquerque International Balloon Fiesta. 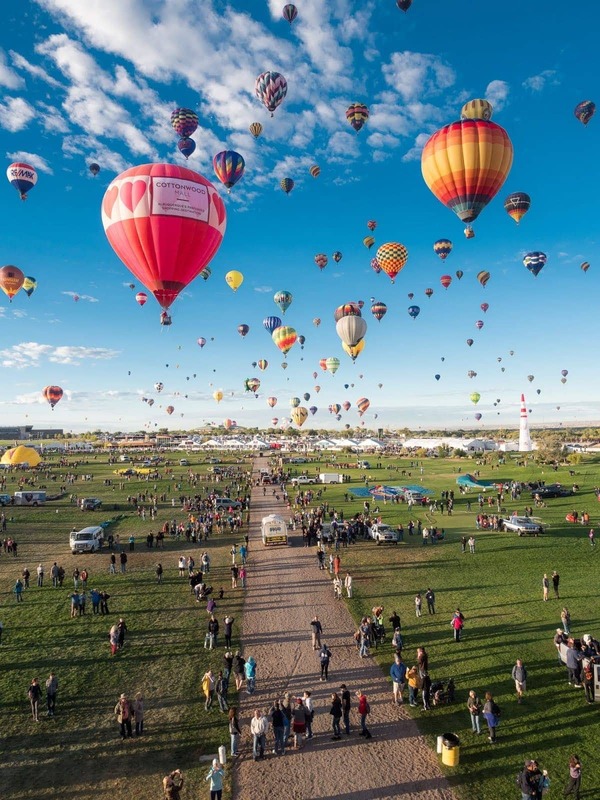 This is the largest balloon event of its kind in the world, and it plays host to around 600 hot air balloons, who fill the skies over Albuquerque for almost two weeks! 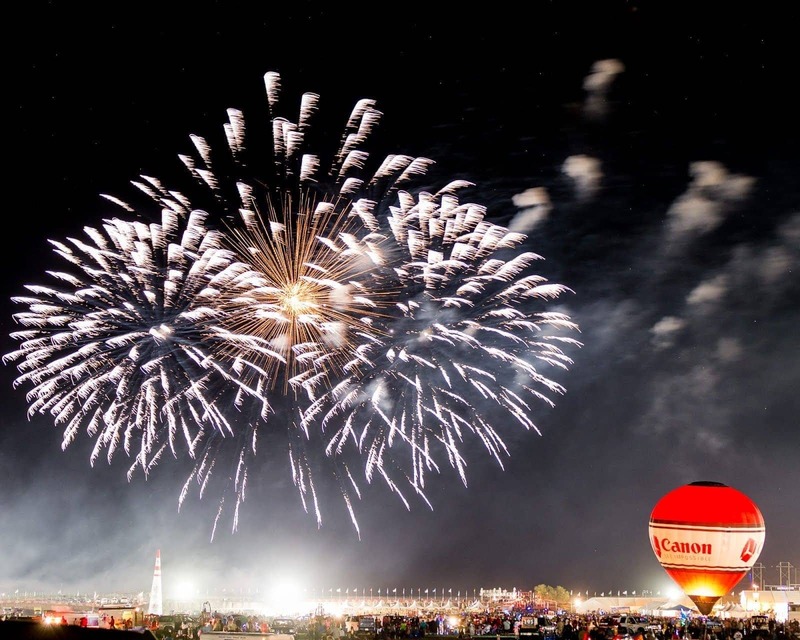 It’s billed as the most photographed event on earth, and the largest event in the USA. Obviously – we had to visit! This post is going to be a photo essay of our experiences visiting the event. 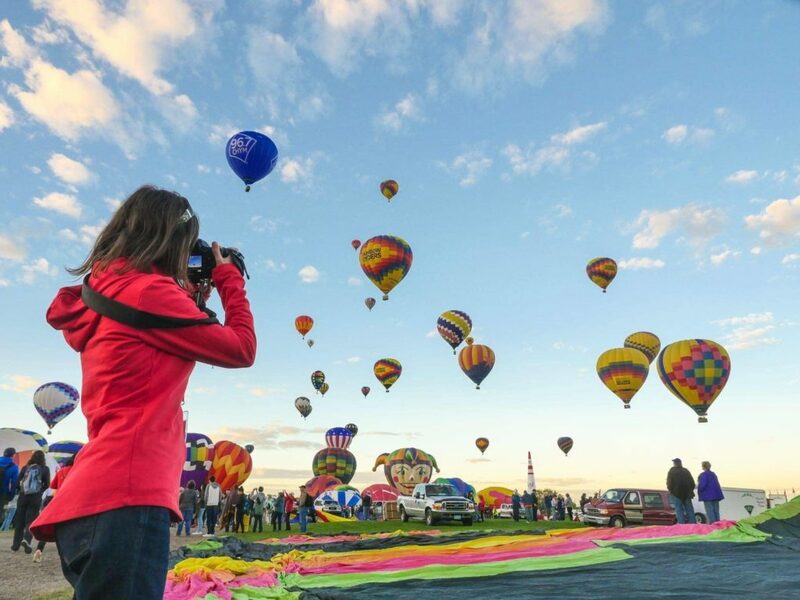 For lots of advice, tips, and everything you else you might need to visit, check out Jess’s incredibly comprehensive post on visiting the Albuquerque Balloon Fiesta! We attended over two days of the first weekend, and we had a backup day of the Wednesday as well. 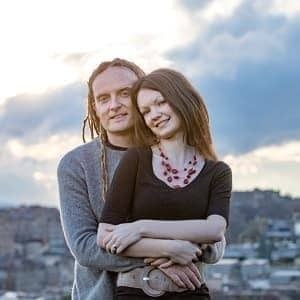 Jess covers all this in her post, but for the best experience you really want to visit on one of the days when there is a mass ascension – i.e. 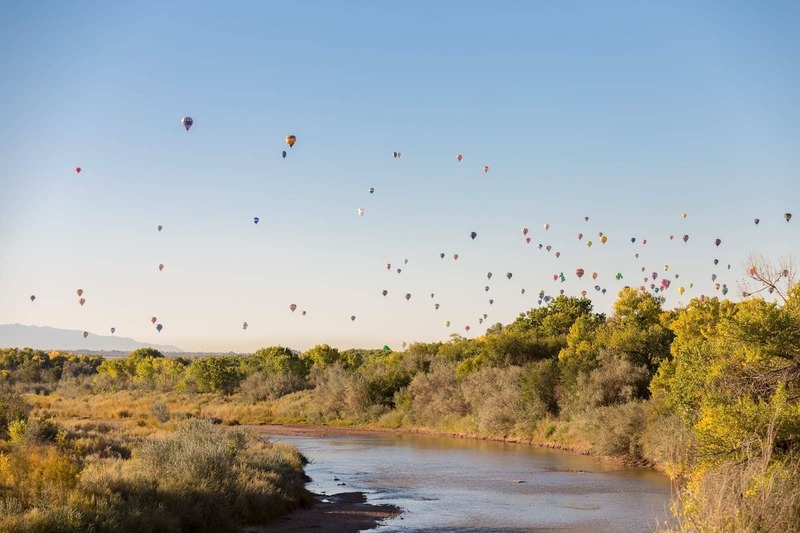 all the balloons on the field launch. 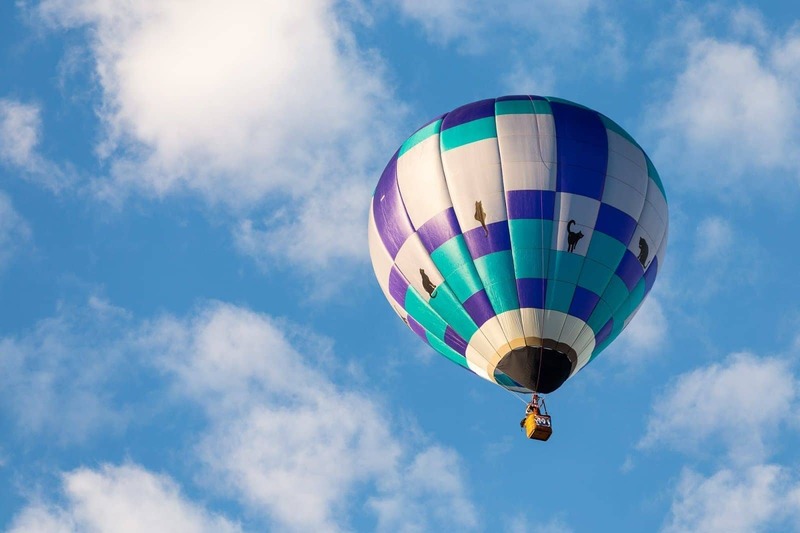 The days start early, as balloons tend to launch around sunrise! The first event of the day is the dawn patrol, where a number of balloons go up to give an indication of wind directions. 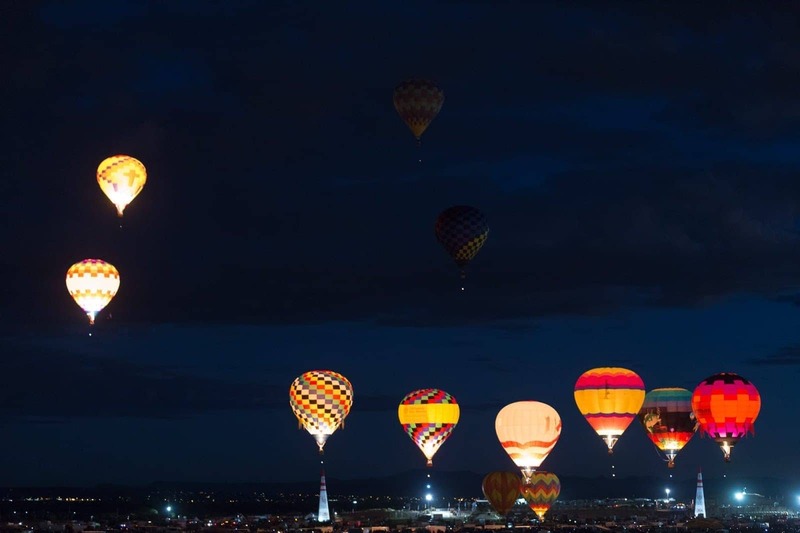 This happens just before the sun comes up, and is a wonderful sight, as the balloons all glow. 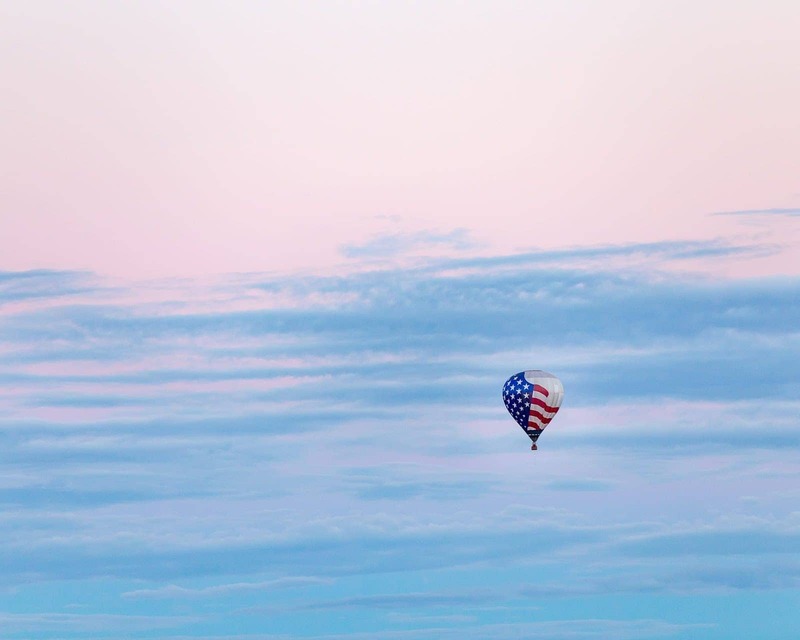 The dawn patrol balloon float around for a while as the sun starts to rise. And yes, you get some pretty stunning sunrises in New Mexico! When the flag balloon goes up, the National Anthem is played over the PA system. Once the green flag is given after the dawn patrol, it’s launch time! 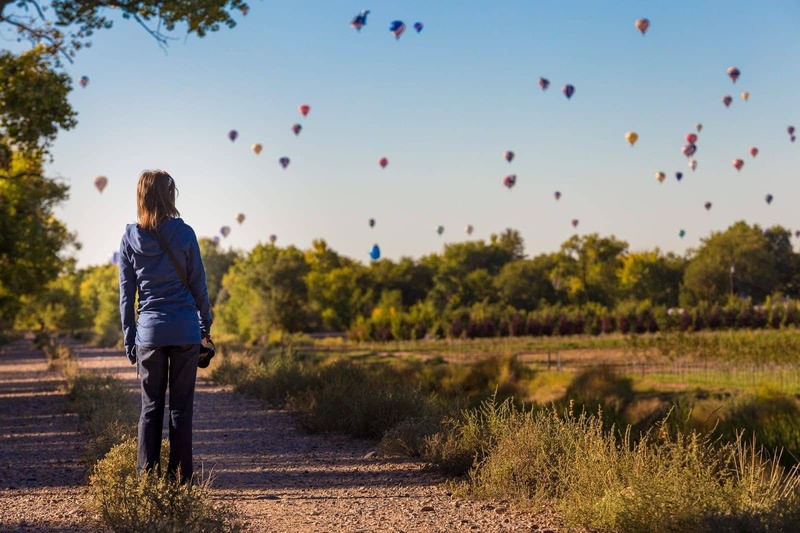 We were amazed how close you were allowed to get the balloons – you can just walk right amongst them! 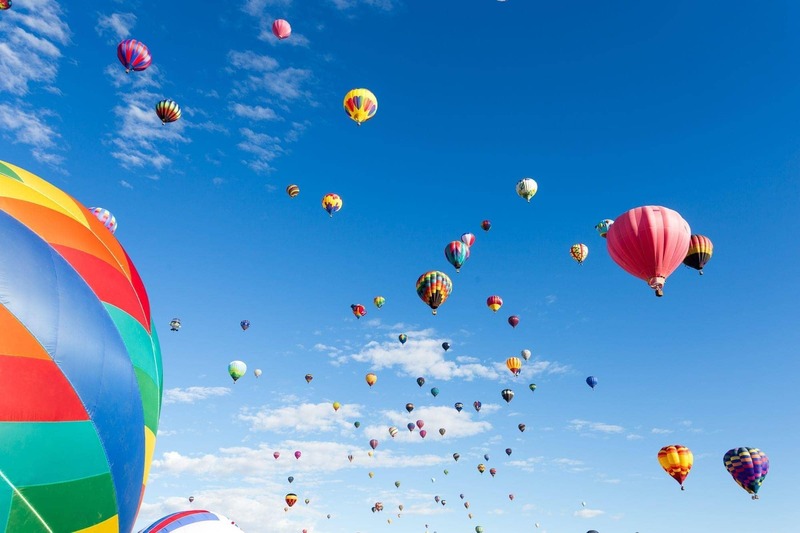 There’s nothing quite like being on the field as 600 balloons launch into the air around you. 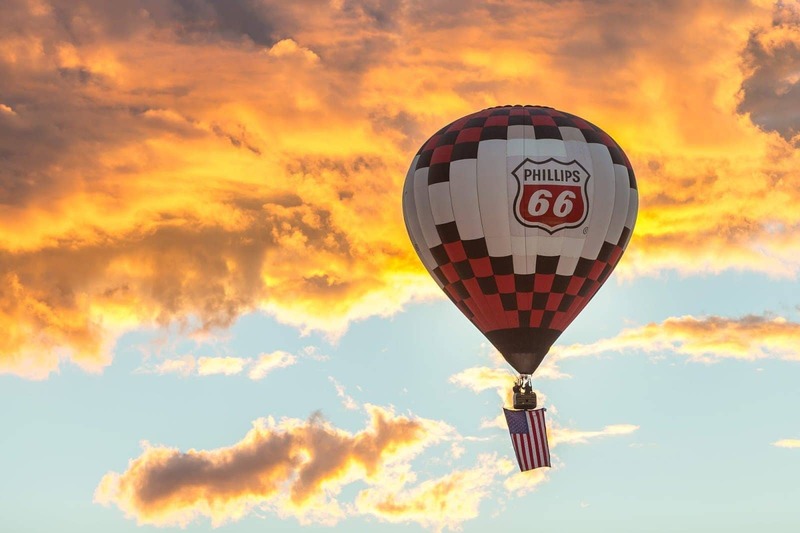 We met the pilot of this balloon when we visited the White Sands National Monument, and we helped out. 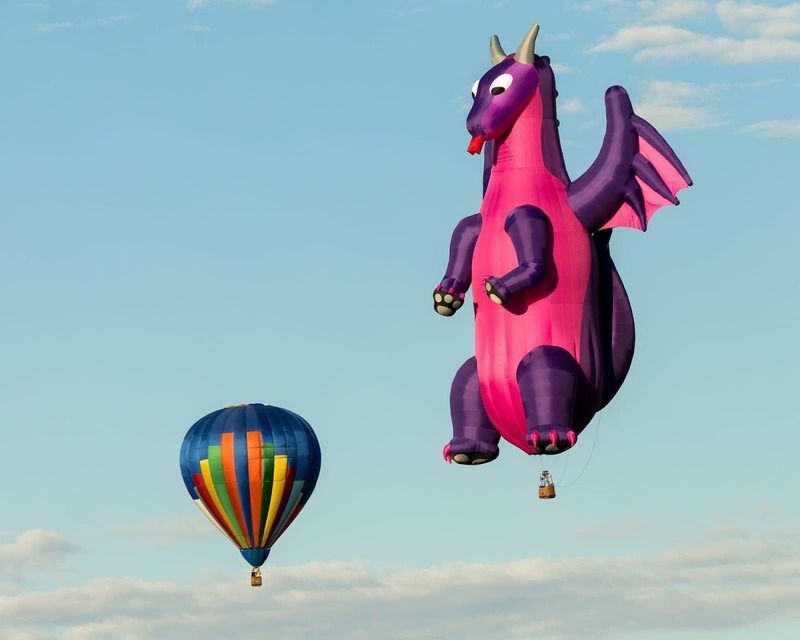 It was lovely to reconnect at the Albuquerque International Balloon Fiesta! This was probably Jess’s favourite balloon. This was my favourite balloon! Although these guys came close second. There are loads of “shape” balloons! These are really fun to spot. There was also this guy, who seems to have forgotten his basket. Plastered across the back of his tank were the words “Experimental”. He’s definitely braver than me. 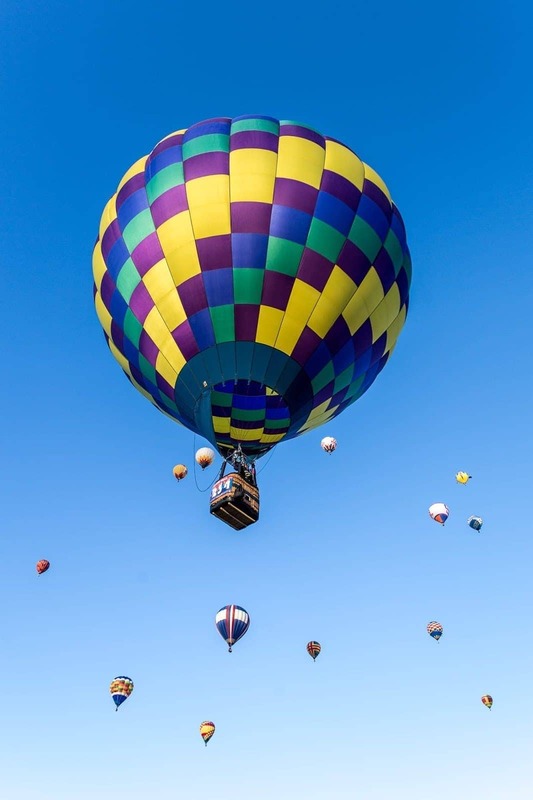 Of course, watching the fiesta from the ground is amazing, but even more amazing still is being able to get a ride in one of the balloons during a mass ascension. 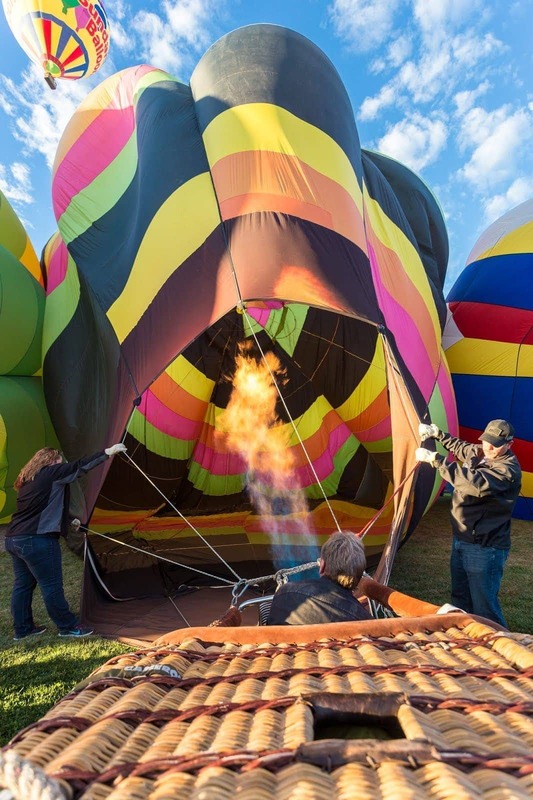 I’ve ballooned before, but we’ve never experienced anything like this! Yep, the view from the air is tough to beat. 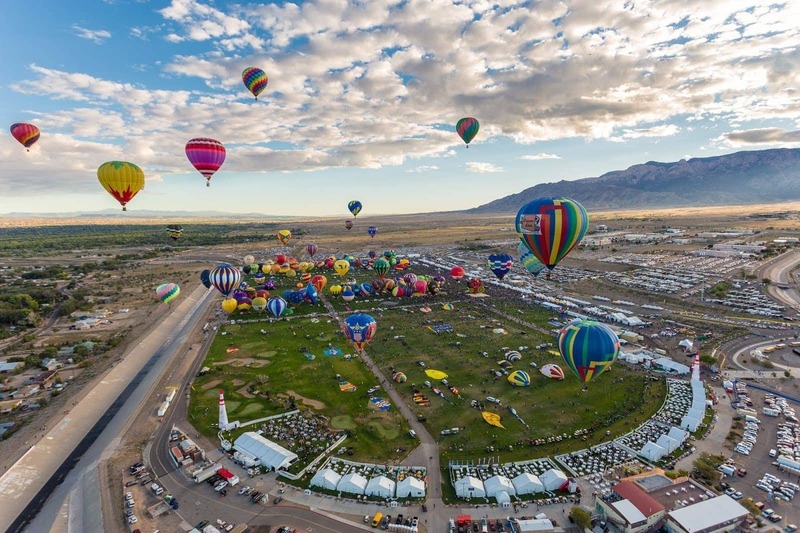 Looking back at Balloon Fiesta park as we took off. 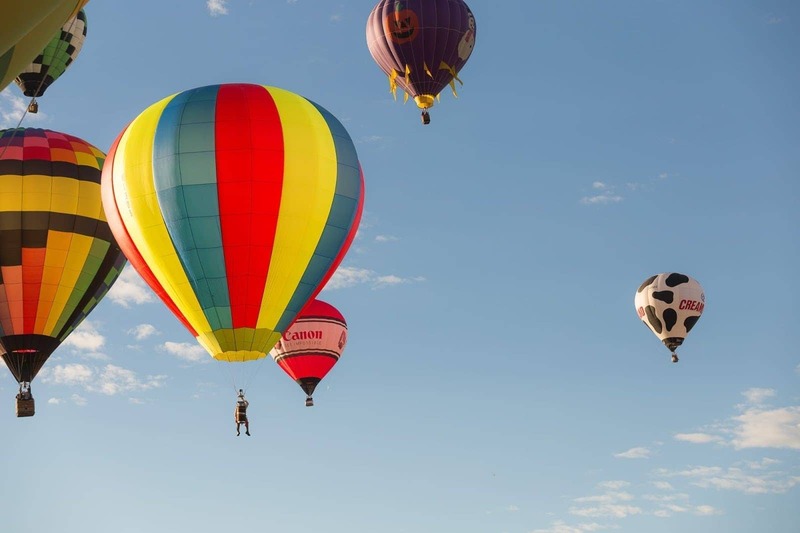 After all the fun is over in the morning, there’s generally a bit of a break in activities through the middle of the day as balloon crews go pick up their balloons, and then usually either have an afternoon rest, or a gathering in the field. 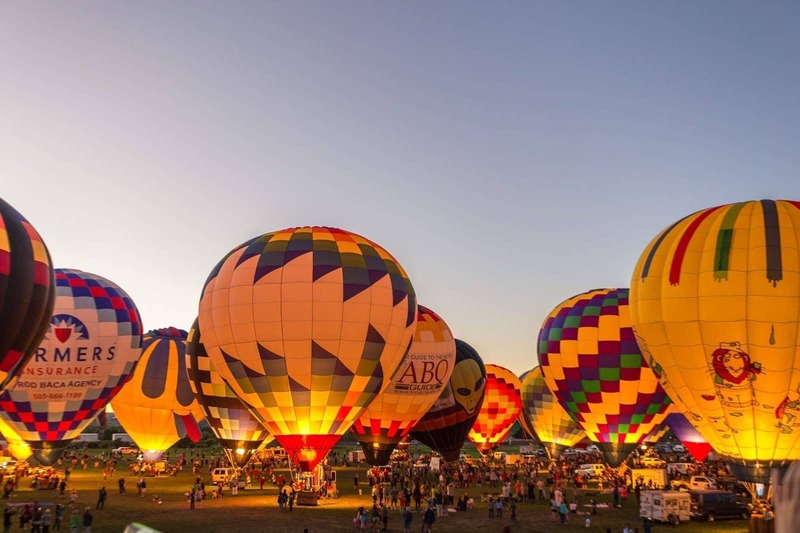 The fun isn’t over though, as they have an evening Balloon Glow! This is where all the balloons are inflated, but not actually launched. 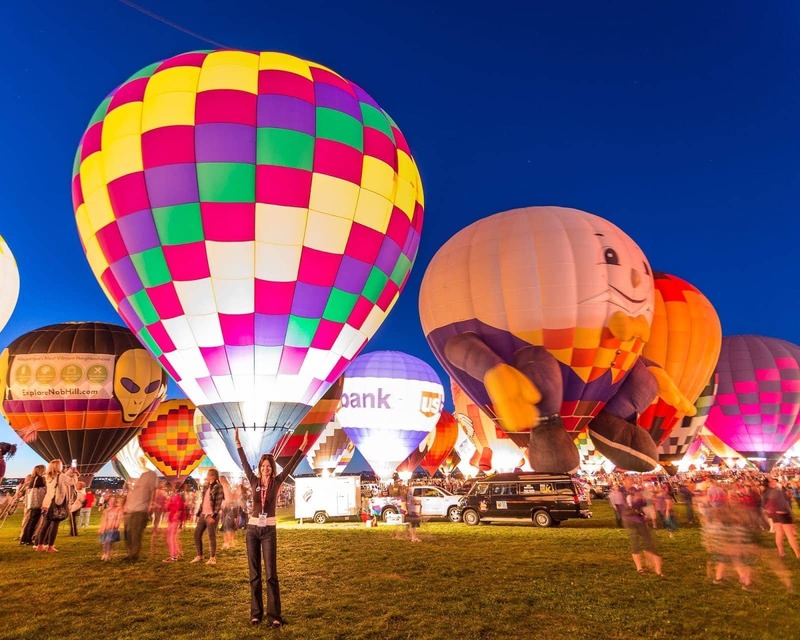 As it gets darker, the balloons “glow” as the pilots fire off their burners. This is done in a co-ordinated fashion, and looks very cool in action. Again, we loved being in the heart of the action and being able to get so close to all the balloons! After the glow, there’s also an evening firework display, which was one of the best fireworks displays we’ve seen. Finally, you don’t have to actually attend the festival fields (although we highly recommend you do!) 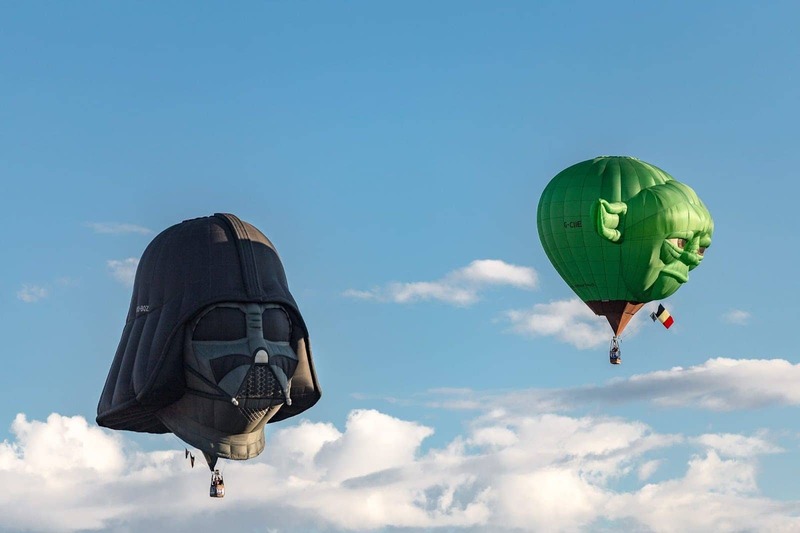 in order to see the balloons. 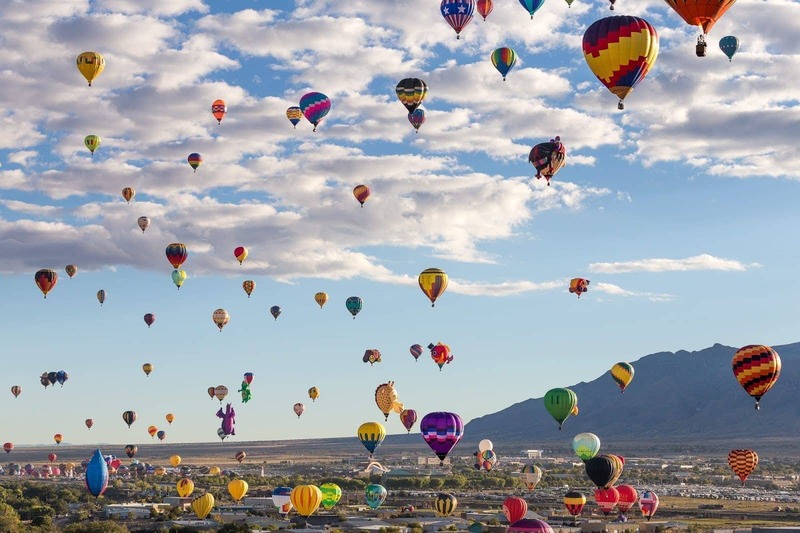 As soon as they launch, the skies over Albuquerque become filled with balloons, which you can see from all over the city! It’s quite an amazing sight! 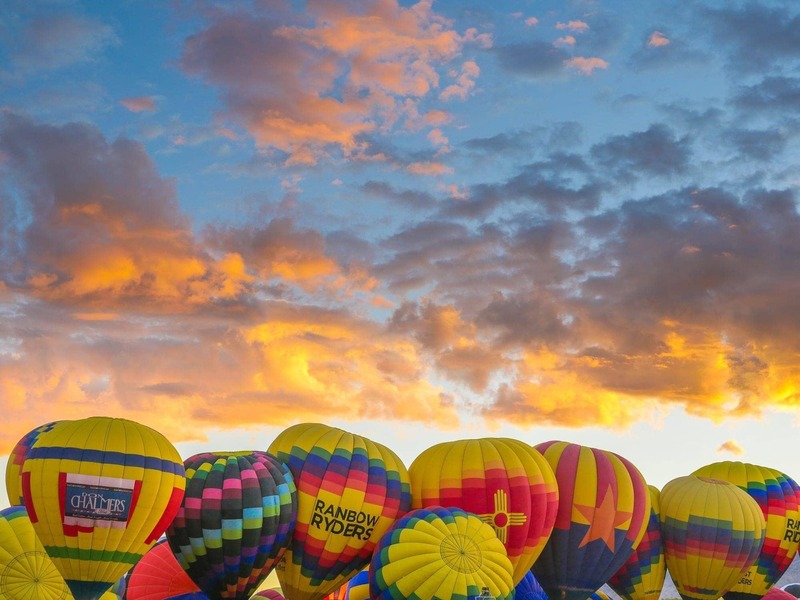 And that wraps up my photo essay on the Albuquerque International Balloon Fiesta. 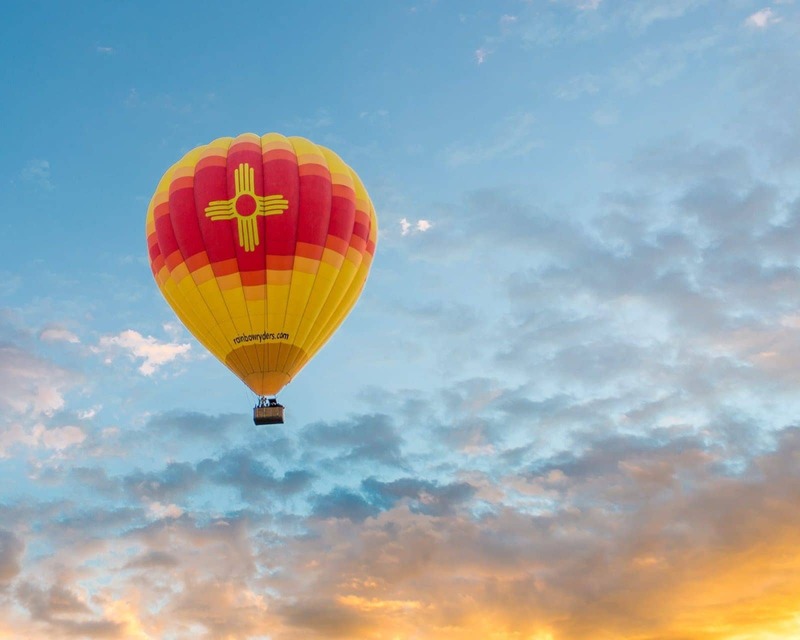 Don’t forget – find answers to all your questions about attending the Albuquerque International Balloon Fiesta right here, plus for inspiration on visiting Albuquerque, see our guide to the top things to do in Albuquerque, and where to eat in Albuquerque. 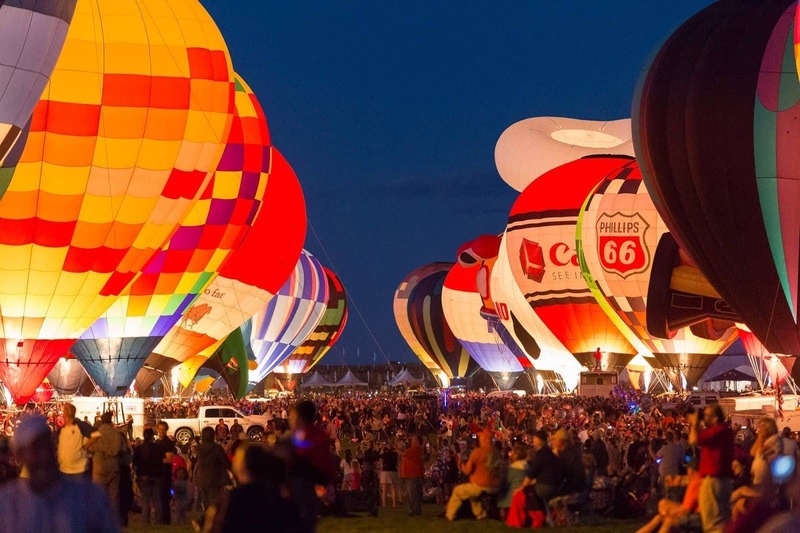 This will be my 1st time coming to the balloon festival. Hopefully 2019 will be the start to a beautiful tradition. Not sure where to go or what to expect. I’m looking for helpful information to make this the best experience. Enjoy, and enjoy the fiesta, it’s fantastic! Can you tell us where you took the pictures that were not at the festival? I love the scenery! It really varies for the balloons as the winds shift the directions they go in, so you have to really just hope as you go! 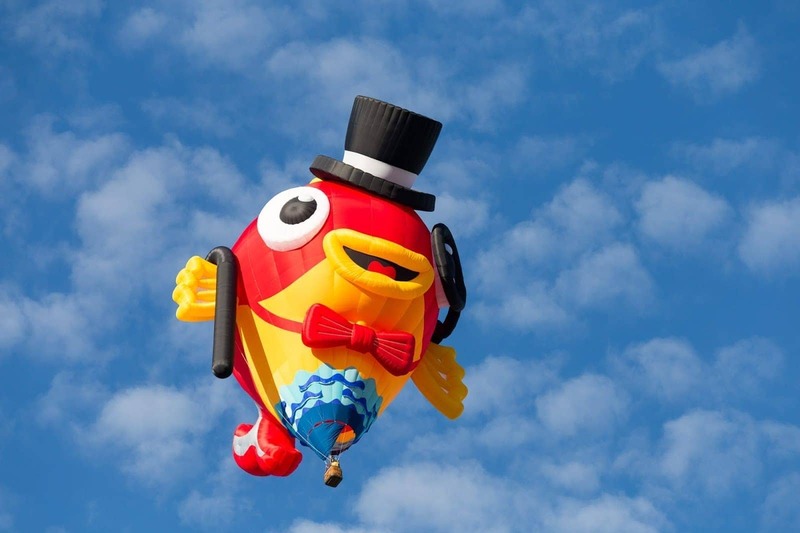 Do you happen to know a flight path for the balloons? We are wanting to shoot them from some different angles like you did like from the river or from the mountains but don’t know what would be the best part of the river to be in. Any information on that would be awesome! WOW ,. They ALL WERE AMAZING !!! 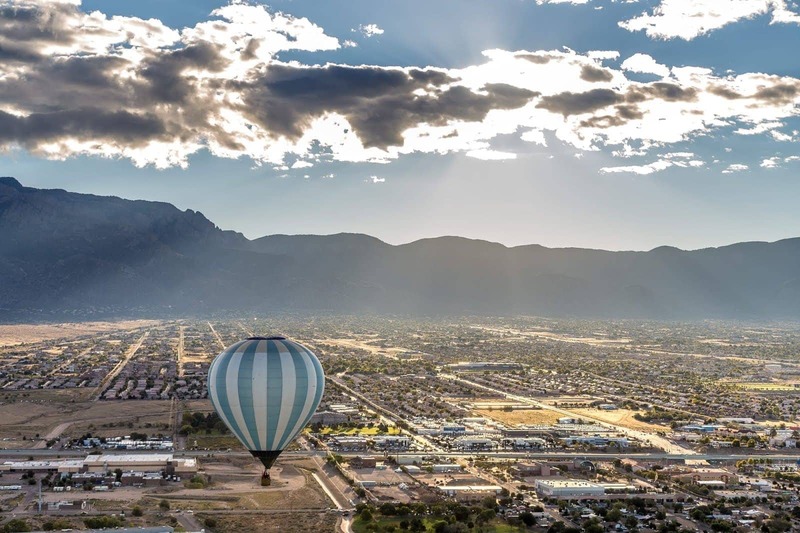 I’m afraid of heights but this ALMOST makes me want to go balloon riding ! I said ALMOST , LOL .. THANK U , SO MUCH ..! !